The 5 most important things I’ve learned as a blogger. If you’re not into blogging, come back in two weeks and I promise we’ll get back to all things personal finance. 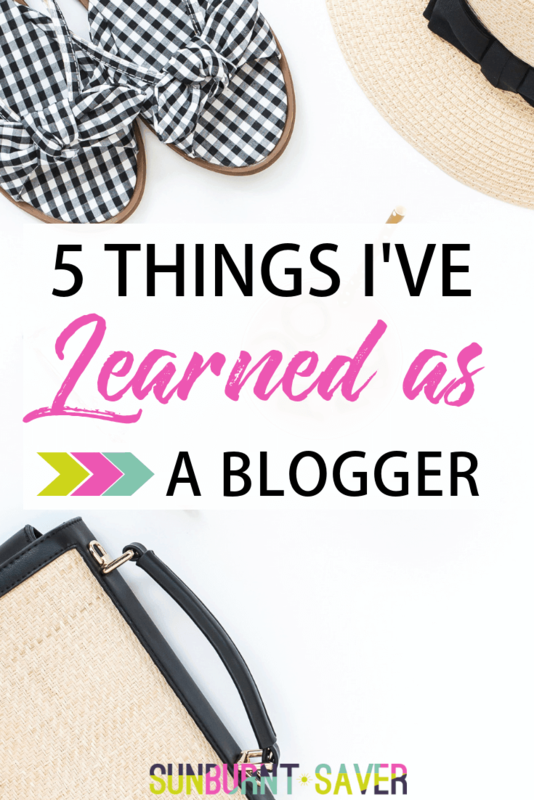 Until then, here are five things I’ve learned as a blogger. If you’ve ever thought of becoming a blogger but didn’t really know what it was like, this will help to answer your questions! When people think of blogging, they’re either completely confused, or they think I just type out some stuff for 30 minutes, hit publish and money rains down on me. Unfortunately, it’s neither one of those things. Blogging is awesome, but blogging is tough. Trust me. Before becoming a blogger, there are a lot of things that you’re going to have to learn. For example, what do you know about unlimited hosting? That’s what I thought. If you’re thinking about blogging, either for fun or profit, here are 5 takeaways I’ve learned while blogging. Whenever you need blogging inspiration, you sit down at your desk and… nothing happens. You get on Pinterest, Facebook, Twitter and still – no inspiration! But the second you step into the shower (go to bed, are driving, etc. ), you think of a million amazing article ideas. You swear you’ll write them down as soon as you can but… you forget, and there goes your blogging inspiration. Or you’ll be like me and write down what you remember, only to return to it and say “wtf did I just write?! Was I on acid? !” And then, if you’re me, you try to make it work anyway. Tim Gunn is always in my head. One way I’ve gotten around some of this is taking a day, or a few hours, just to leave the house and write down all of my blogging ideas. Maybe it’s inspiration from a post I’ve read from another blogger, maybe it’s current events that has me thinking. Most of the time, it’s something I learned the hard way and want to share with people so they don’t make the same mistakes. That way, when I do sit down to write, I have a solid list of at least 20 different ideas I can pull from. When you’re a blogger, you don’t have time to sit at your desk and stare at the computer. You have to make it work! If you want to become a full time blogger / freelance writer / VA, etc., you may think the word “schedule” is terrible. Schedules are for people who go into an office to work, right? Yeah, that’s what I thought too – and then I turned into a grubby hobo. 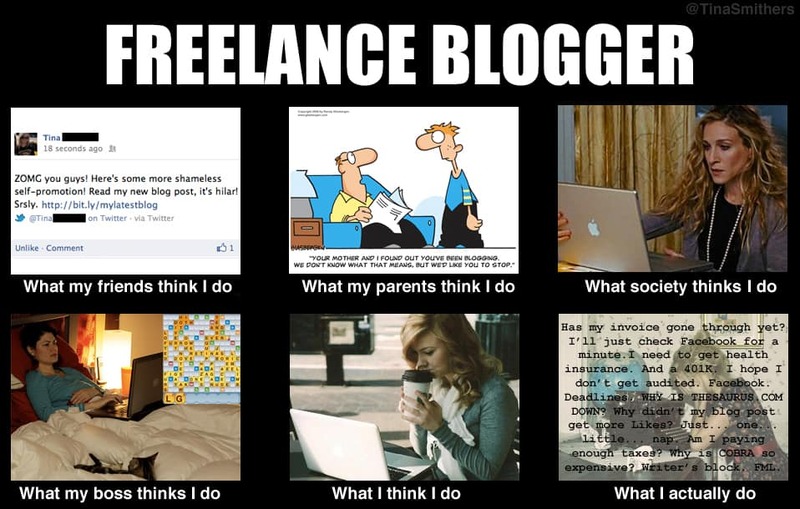 Just kidding… but for real, if you’re blogging, you probably want to help people with something. Not saying “you must write 3 blog posts a week or else”, but people get used to schedules, and if they don’t see you post for months, they’re going to stop visiting your blog. In order to make sure I was publishing (mostly) on time, I had to set a schedule – and for me, that meant writing in the mornings. It’s still the best way I get interrupted, clear-headed time to write. Figure out when your best writing time is. It may be later at night, it may be at midnight! Whatever works for you, fit it into your schedule. Are you getting the picture that blogging is a lot of writing? It is! But hopefully you started your blog because you have a message, you want to share it, and writing isn’t that bad. Don’t forget dictation services too (even Google Docs has the ability for you to dictate your blog posts!). But you just have to do it! Sometimes it can be hard to always think about headings, formatting, images – all the “extra” stuff bloggers have to do. If you’re getting frustrated with all of this, just write! Forget about headings and formatting and indentation and just write. For instance, in this post, I hope it answers your question about what blogging is like, what goes into it, and what it takes to be a consistent blogger (I’m going into year 5 of blogging next year!) As long as you’re thinking of your reader, don’t worry about all the other things too much. When people tell me they don’t know what to write about, I just stare at them. Unless your blog is super niche-y (like vegetarian recipes for frogs, or something), blogging inspiration is everywhere. Especially in personal finance, where everything personal has some financial component, anything around you can and should be inspiration. For most of us, we started blogging to help other people – or help us work through things. As you blog and start to get recognized by other people, it can be easy to fall into the “social media promotion / have to talk to everybody” trap. You can get caught up in the idea that you always have to be marketing yourself, and begin to lose focus of why you started blogging in the first place. Forget other bloggers – focus on helping your readers first. I’m not saying don’t be friends with people (I like connecting with other bloggers!) but don’t let it take up all your time. Your time should be 60-80% helping your readers (brainstorming, living your life, writing, interacting with readers via email) and 20-40% promotion, talking to other bloggers, etc. If you want it to, money and more recognition will come. But none of that will happen if you get so focused on promotion and stop blogging. Remember why you started blogging in the first place, and make that your priority. Not sure how to get started? I just created a 5-day Intro to Blogging email course you can sign up for below. I’ll share all the tips and tricks I’ve learned from 4 years of blogging so you get started off on the right foot! Sign up for your free Intro to Blogging email course below! I love this one! I have a very crazy month of July because my friend just arrived from abroad, so most of my time we spent together with some of my friends, thankfully she will go back to abroad tomorrow so it means that I will concentrate on my work again. That’s so much fun! I hope you had a great time with her visit 🙂 I know it’s tough to spend time on blogging and client work while having a friend visit, though! I really miss having a routine. Between being unemployed, then a shift worked, now unemployed again, all while living with another shiftworker, there is no routine left in my life, and I struggle to get things done without one. I get that! I’m not a shift worker right now, but when I was, keeping track of what day it was was incredibly hard. It helps to have a calendar in front of you at all times (like on the wall or at your desk), but I agree. Without forcing yourself into a routine, it’s easy to feel adrift. I’ve been finding that writing down my ideas is extremely helpful. I’ll usually email myself so that I can check my notes in my inbox every morning. It definitely seems like the best ideas come to you when you’re not working. SO true about the shower, lol! Also love your points about writing on a schedule with a reader “take away” in mind and working on your blog with the goal of helping your reader. All of those are things are helpful to me in finding focus as I start out.